Love was in the air at the Country Thunder Music Festival in Arizona this year! The popular country music festival boasted quite the lineup this year, with headliners being Tim McGraw, Dierks Bentley, and Chris Stapleton. Other acts included a mix of legacy artists and up-and-coming stars, including Lonestar, Trace Adkins, and Austin Burke. 2019 marked Burke’s debut on the festival’s main stage. He performed earlier in the day on Saturday (April 13), with a few acts being between him and the night’s headliner, Bentley. It turns out that Burke and the “Burning Man” singer actually have a solid connection. The two are both natives of the Valley! Burke agreed, and at the end of the song he brought his girlfriend, Lexy Kadey, up on stage to join him. Little did Kadey know that the whole performance had been orchestrated by Burke and Bentley in order to give her the surprise of a lifetime. 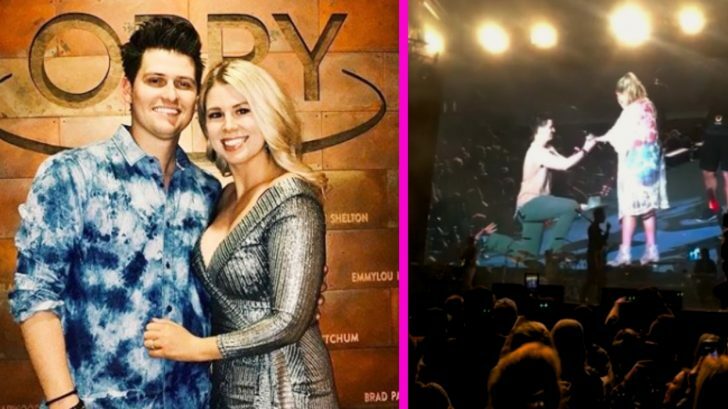 In front of the thousands of people watching, Burke spoke of his love for Kadey, saying, “Not only are you my best friend, but you’re the love of my life.” Then, much to his girlfriend’s surprise, he dropped down on one knee and asked her to marry him! We’re sure that Bentley was happy to help! Some audience members happened to capture parts of the proposal on film, and you can catch some of those videos below. You can tell that Kadey was so surprised! A huge congratulations to the happy couple! That is a night they are sure to never forget. After watching Burke’s surprise proposal, it seems he truly does embody the title of one of his most popular songs…”Whole Lot in Love.” Be sure to watch the video below of him performing the sweet song!